I know there are many lulu addicts out there, many of which I am friends with (don't worry, I won't call you out by name ;)), but I have to confess, I have never been one of them. Although the quality of the gear that lululemon sells is AMAZEBALLS, the cost has always stopped me from making the splurge. I am very frugal so end up spending $10 on clearanced shorts from TJ Maxx rather than dropping $60+ on a pair from lulu. With that said, if I ever won the lottery, I would totally upgrade my running gear to all lulu all the time! Anywho, I wanted to share how my love for lululemon that has VERY LITTLE to do with the clothes. Yup, you read that correctly, I want to tell you why I love a company that I have never bought products from and it has nothing to do with the products themselves, but hopefully by the end of the post this will make sense. It all started last year after the SeaWheeze Half Marathon (in case you are unaware, this is a race sponsored by lulu up in British Columbia). 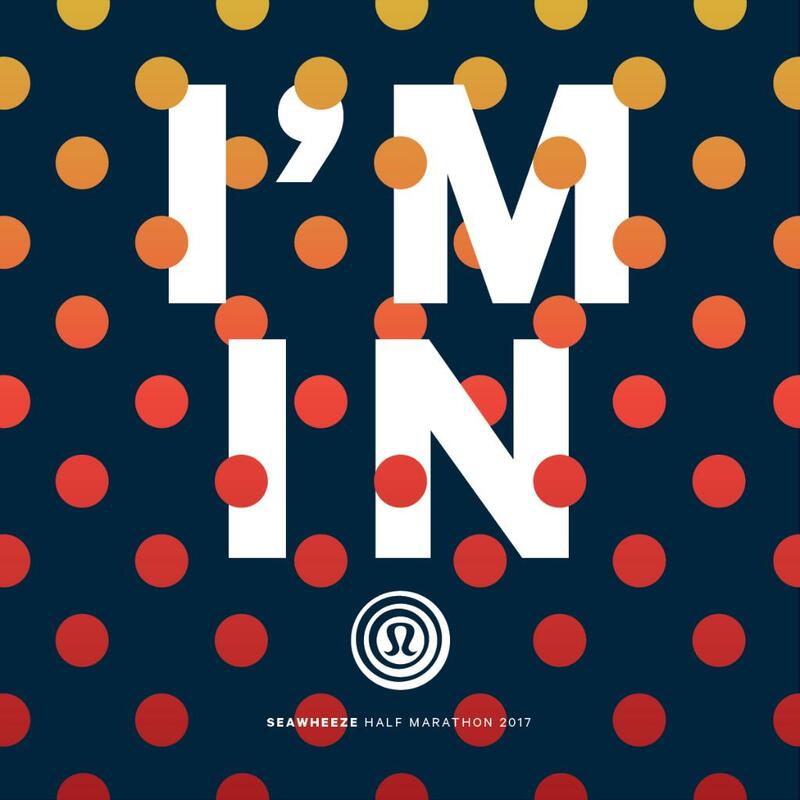 I was sharing my recap about the race on social media and mentioned that it was my 30th half marathon. Well, lulu saw that and said that they wanted to send me something as a way to celebrate/ commemorate the achievement. I thought it was a sweet gesture and figured may I would get a sticker from the race or something. They asked me for my shipping address and once I sent it over I sort of forgot about it. A few days later I received an email from a local spa. You see, lulu had contacted a spa up the road and purchased a gift certificate for me as a way to celebrate and relax after running my 30th half marathon. Um... HOW FREAKING AWESOME IS THAT?! Not only is it a gift that took thought, but it is also helping to support a local business! The next reason for the love was not something that I experienced first hand but definitely saw it unfolding on social media and wanted to applaud lulu for the way it was handled. What I'm talking about now is when registration for the 2017 SeaWheeze opened. You see, this is a very sought after race (it literally sells out within MINUTES). Shortly after registration opened I saw friends mentioning how they were unable to get their payment to process and were missing out on being able to register for the race. Apparently there was a hiccup in the registration process and some folks who should have been able to get in were unable to register before the race sold out. 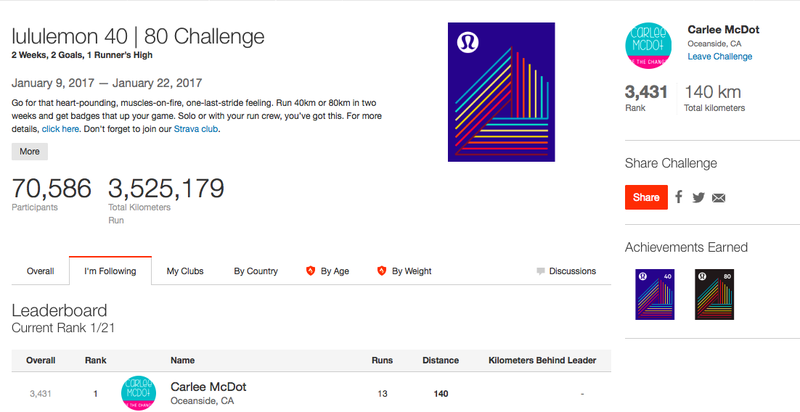 And lastly, let's talk about the recent lululemon + strava challenge. I am on a group text with some major lulu lovers. They mentioned that lulu was teaming up with Strava to create a challenge where you could run either 40km or 80km (remember, lulu is a Canadian company, hence the metric system) and possibly receive rewards. No one knew if the rewards would simply be the Strava badges or something else, but I decided to sign up anyway. This challenge just happened to coincide with a peak time in my marathon training so I was able to tackle the 80km (which equates to 50 miles) within the two weeks without a problem (as you can see from my finishing info above I ended up with 140km). Once the challenge concluded, the participants were told that they were getting FREE GEAR! Yup, if you hit the 40km mark you would be able to pick up a tee (Metal Vent Tech Short Sleeve for the guys and Swiftly Tech Short Sleeve for the girls) and if you hit the 80km mark you would be able to pick up a pair of shorts (Surge Shorts for the guys and Speed Shorts for the girls). Can you believe that this new outfit is my first lulu gear I own?! HECK TO THE YES! I will be completely honest, even with all of this love, I don't know that I will be quick to switch all of my running gear over to lulu, but when I've got the extra cash, you better believe I will treat myself and show lululemon the love that they have already been showing me! 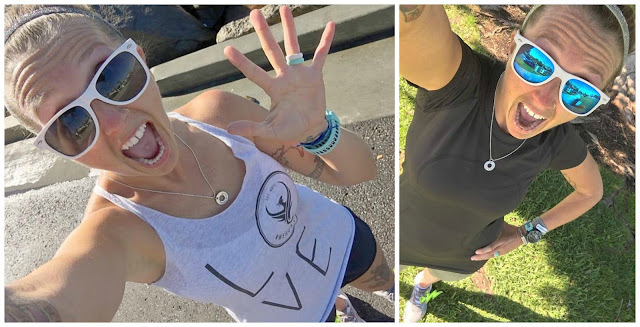 I wore the shorts for a 5 mile progression run and the tee on my last long run. Do you love a brand for more than the products or services that they provide? I am the same as you. I own some lulu pieces but all have been on sale. I love the interaction on social and the challenge was freaking awesome. That is awesome! What a great outreach program they have. I don't have any lulu items myself, but this really makes me want to support them! Lulu paid for city bikers to take runners back to their hotels after the 2016 Chicago marathon! I've never been so grateful for a brand's thoughtfulness!